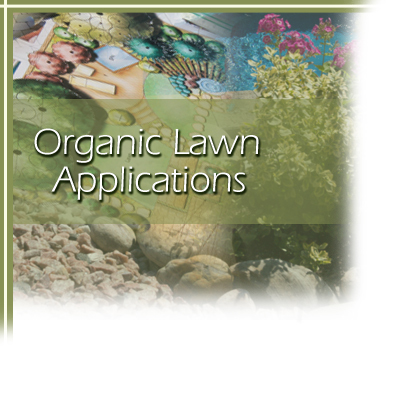 We believe in an organic approach to lawn applications. The benefits of organics far exceed traditional chemicals and pesticides. Chemical pesticides add poisons to the soil that kill insects and turf diseases. Synthetic fertilizers can lead to a compacted soil structure by compromising biological activity, and its runoff pollutes our waterways. Organic lawn applications treat the soil and create a living, healthy environment for grass to thrive. Beneficial organisms such as enzymes, bacteria, and microbes will build up in the soil and reduce the stress on your lawn in many ways. As soil structure improves; oxygen, water, and nutrients will be freed from the soil and become more available for use by grass plants. Natural lawns will be able to better resist insect pests and diseases naturally and are safe for people and pets. Your lawn will ultimately become healthier as the soil becomes alive again supporting a natural, living ecosystem. Avoid adding toxic pesticides and synthetic fertilizers and be more responsible to your family, your pets, and the environment. Welcome a healthier lawn and an ecologically responsible attitude. As various environmental agencies issue mandatory changes to the use of traditional fertilizer and pesticide applications, Arrowwood is ahead of the game with our emphasis on organic solutions. There may, however, be certain occasions where chemical pesticides are needed to correct a specific problem or help the lawn cope with extreme conditions. An integrated pest management system may be necessary during these circumstances. There are many different kinds of organic pest control applications for trees, shrubs, flowers, and vegetables. These should be considered before the use of chemicals.